You hear the righteous choirs singing in your head. They sing of glory and destruction. They sing of conquest. You rush ahead, up the stairs, along the castle walls. The guards try to stop you but you dodge some. You attack some others to throw them off balance. You run. You practically fly because you have your sights set on your goal. This time, this glorious night you will succeed and throw the empress from her throne. You’ll get the justice you wish for, the justice your family deserved ever since it has been driven from these lands. You’ll stop her reign of terror, that’s what you keep repeating to yourself. No locked door can stop you now. The magic in your veins allows you to break them with a single touch of your hand. Your allies have done their deeds as well. They poisoned the high guard and its numbers are reduced to a handful of soldiers. The rest has come down from food poisoning. Knocked out but not dead. The only death tonight will be her, her life yours to take. That has been your intent ever since she deemed all of you unworthy of continued existence. You feel the steel of your blade in your hand. It sings for blood. Blood of the oppressor. Spirits high, but blade held higher, you barge into her quarters. No one dares fire an arrow here. She seems to have expected you and draws her sword, a wicked grin on her face. This was an easier request. I was already familiar with the song from many hours playing Final Fantasy XIV and its grand theme invites an equally grand scene, like a battlefield, or something with a lot of fast action and drama. I believe that political impact is important for this piece, that’s why I had an assassination in mind. Or rather, a noisy coup then a sneaky assassination. I wanted to play Anno 2205 for quite a while because of its setting in the far future, being able to colonize the moon and all that, but I was never entirely sure it is the right kind of game for me. I usually stick to more story based games. However, after giving Surviving Mars a try and finding it overall very enjoyable, my opinion against buying the title wasn’t as strong as before. I consulted a friend who ensured me that if I liked Surviving Mars, there’s a very good chance I’d like Anno 2205 as well. Some time later, I snagged the game as well as all its expansions for €14. Overall, I immensely enjoy seeing different visions of what our far future could look like, be it The Expanse, Anno 2205 or Surviving Mars, maybe even Deus Ex: Human Revolution. I truly hope we - as the human race - will make it that far without annihilating ourselves over petty conflicts or choking in our self-made garbage problem. Now, what is it that makes these scenarios more interesting? They have visions of what will be better, but the makers of these works of fiction acknowledge that the future will also have its own problems - something that comes up too rarely in “clean” fiction like Star Trek. The Expanse has a myriad problems, from Earth’s overpopulation, to the political climate of Earth versus Mars, to the general suffering of people in what’s called the Belt. Surviving Mars has at least one scenario in which a Third World War is happening on Earth. Leaving Earth for Mars is pictured as dangerous but also very promising, while conflicts on Earth don’t cease. While your Marsian colony is backed by an entity on Earth, you can make it without overly relying on them. Anno 2205 has its own share of political problems with the first wave of colonists on the moon being very unhappy and taking military action against your cooperation back on Earth. The game also acknowledges climate factors, like arctic nights and smog. The further you progress the more you might be horrified by how much of what you ship around the globe are actually not necessary products but consumer goods. It’s a crass reminder of how far consumerism has progressed. I wonder if it might have made sense to include some waste management mechanic to convey a more ecologic perspective for the future. With that prelude out of the way, let me tell you about a corporation called Abstergo Industries (I usually choose that Assassin’s Creed-inspired name for companies in video games). Abstergo Industries started out relatively small in a region called Cape Ambar in Earth’s temperate region. It was there that they collaborated with Ibarra-FoxCom when trying to lift an old ark out of the depths of the ocean - a project that is still ongoing. In trying to face the needs of both its customers and its employees, Abstergo expanded to Kinngait Protectorate, a region in the arctic. The company showed both its resourcefulness in settling the uninviting region as well as its good will towards the Arctic Custodians by helping with repairs and research concerning one of Earth’s Climate Stabilizers. Dedicated Abstergo security professionals stopped several attempts by terrorists trying to disrupt Abstergo’s supply lines and operations. Its growth progressing smoothly, the company was proud to launch its own space station hosting a wealth of scientific experiments. Furthermore, their expansion onto Luna was a great success, with the first base being situated in Iwamoto Crater. Here, a collaboration with Cassian Industries led to a very profitable operation in mining meteroids. Only a while later, Abstergo would settle in a second lunar region, Novikov Crater, to help with refugee relief efforts. Using a massive fleet of cargo ships, shuttles and space elevators, Abstergo grew from a small company into a massive MegaCorp and expanded into one more region - Vanha Plains in the Tundra. As the company developed, so did its awareness of logistics and environmental needs, leading to the implementation of several optimizations in its production processes building on scientific breakthroughs from its orbital science team. Fewer transport routes would be needed and more goods could be sourced locally. Additionally, in order to provide a clean environment for its inhabitants, Abstergo started separating sectors into living and production areas, leading to happier and healthier citizens. With Abstergo drawing a healthy amount of investors, financial options seemed to skyrocket, leading to the company aquiring settlement rights for Walbruck Basin, Greentide Archipelago and Wildwater Bay. Development of these areas is still in progress and reports about local activity are scarce. Rumors have also surfaced about a potential health hazard from Vanha Plains, but the company keeps a tight lid on these issues. Abstergo Industries has announced it will enter the stock market later this year. My mind latches to something that is still on my desk. I only recently took it out of a bag I use for work. It’s a ticket to a show of Apocalyptica in Graz, from 2017. I remember talking with A about the show during a vacation in Greece. I wasn’t sure I had the time and nerve to go see it. She assured me it would be nice change of pace and might improve my mood. After all, I tremendously liked Apocalyptica and “20 Years of Plays Metallica by four Cellos”, sounded awesome. I still remember the hoops we had to jump through to get the ticket online and pay with card. It felt more complicated than it should, really. The ticket websites usually do. The seat selection was especially awful, as is tradition for this kind of website. I had enjoyed the Apocalyptica concert in Vienna back in 2010 and decided to splurge the €60 for one of the best seats, a “Logenplatz”. I was looking forward to the concert in that moment. The show was going to be on the Kasemattenbühne, which is the stage at the top of the Schlossberg. Awesome. Flash forward a few days. We had returned to Austria. I wasn’t well. I had trouble sleeping and on the day of the concert I was feeling particularly unwell which prompted me to take a short nap. Which became… not so short. I woke up in the evening, a bit dizzy. A returned from where ever she had been and asked me why I wasn’t at the concert. I had completely forgotten the show. I could’ve started and tried to catch a last few songs but I couldn’t be bothered. I had totally screwed myself with this ticket and the nap. I should’ve set an alarm or something. I mean, you would, right? But sometimes your physical condition does strange things to your awareness of reality. Lack of sleep is bad. That’s not all though. I think I may have been in the early stages of depression back then. I crumble the envelope and throw the ticket into the paper shredder. Maybe I have better luck with 30 years of cellos. This post was written in back in 2017. It lingered unpublished in my drafts folder. Only now - in 2018 - I reworked it and decided I was confident enough to publish more personal stories. The moment you open the door of your hut, you have a bad feeling. Your wife is not there, neither are your children. You had asked them to stay inside because of the impending danger of the hordes. You feel a chill run down your spine. Ice flows through your veins. You start running towards the market stalls when you see the state of your rooms - everything is messed up and destroyed, as if a tornado had torn everything inside. Nobody is at the market and the stalls are broken - splintered wood everywhere, the occasional trampled vegetable. You don’t see any blood but that doesn’t make it better. It seems like no one put up a fight. You run further, to the one friend you’d trust with your live and your family. But she is not at her house. In fact, all the houses along this road are empty, with their front doors wide open and the lights inside still burning. Despair has you firmly in its grasp. This was a little easier to write than the first scene, given that it was both an instrumental piece and from the soundtrack of a game I have played extensively. The theme here is the urge to hurry, to do something, anything not to go mad from inaction. You arrive late to the concert. It’s not really your style, but nevertheless you look forward to enjoying it, having been handed free tickets from a friend. You enter the club located near the exterior hull of the space station, where rent is cheap and gravitation is low enough for many to feel uneasy. The unfamiliar music with synths and Japanese voiceovers is already playing. When you open the door, bright neon lights flash and you see the mob jumping in ecstasy. They cheer to the music filling their lives with joy apart from the dreary daily life. You’re a bit sad that the voice is from an android proxy performer. Certainly you didn’t expect them to show up personally on a mining station that remote? You ease into the beat of the music and move with the rest of the crowd, forgetting your calling for the moment and focus on the beat driving you forward. You haven’t felt this energetic for the whole week and hope it lasts to get you through the rest of this assignment so you can return to your clan where you’ll be surrounded by familiar faces once more. This is the first scene that I wrote to accompany a piece of music. The idea came up during a session of writing music recommendations that didn’t go as well as they usually do, so I tried to mix things up a bit. I asked the participants to give me one song each and I wrote a little flavor text to go with them. This one was inspired by The Expanse, both the novels and the TV series.  I’ve been very active in the Discord belonging to my MMO group lately, including hosting a choose-your-own-adventure style game that’s held regularly. It’s a very fun exercise for me to come up with entertaining texts fitting a scenario as well as the input of the players. I imagine this is a bit like a Dungeons and Dragons campaign with close to no rules. It’s been a joyous experience so far and I want to keep this up to keep my writing in shape for a good while. I might even consider asking the players if it is alright to publish the full story after it has come to a close. On the tech side I find myself shifting more and more away from Vagrant and towards Docker, having gone so far as to remove the VirtualBox layer between my Windows instance and the Docker I’m using to publish this site. Using docker-compose has allowed this to be a lot more comfortable. I had not used docker-compose before but got into it recently. I’m currently working with a rather complex Docker container at work and find myself needing to customize various things. Using docker-compose instead of listing dozens of command line parameters when starting the container has made this easier. I remembered the simplicity of docker-compose when I got annoyed by specifying and remembering all the options. A while ago, a colleague had showed me project using docker-compose but I didn’t see its usefulness - especially when moving between the different OSs - back then. Having worked with the tool myself now, I can definitely see how it’s going to simplify my setup. I find that I want to spend more time writing and am inspired by Matt Gemmell to publish more personal piece as well as shorter articles as well. Quantity doesn’t mean quality after all. 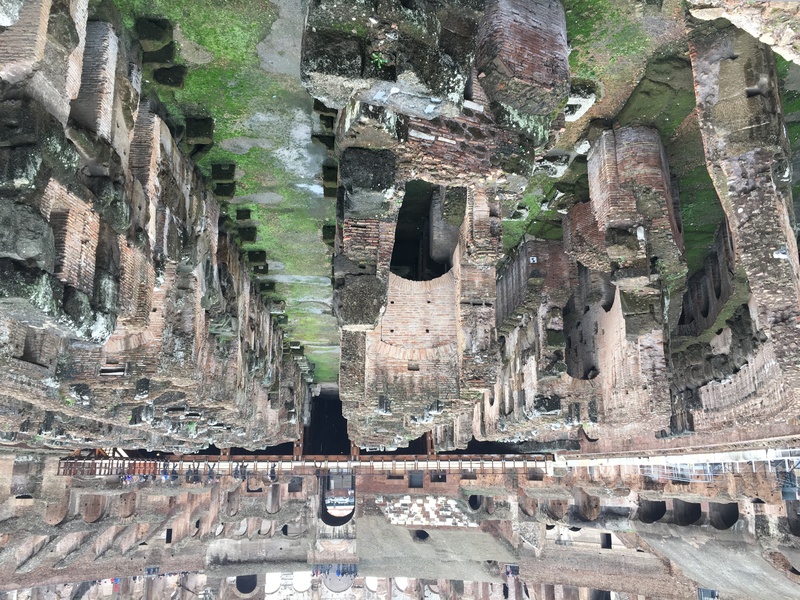 To start this I’ve polished up my notes from Rome and published them as an article. Aside from that, I’m still battling with my Internet provider, trying to find a good balance between sleeping, working and leisure time and finally getting some more things for the new apartment. 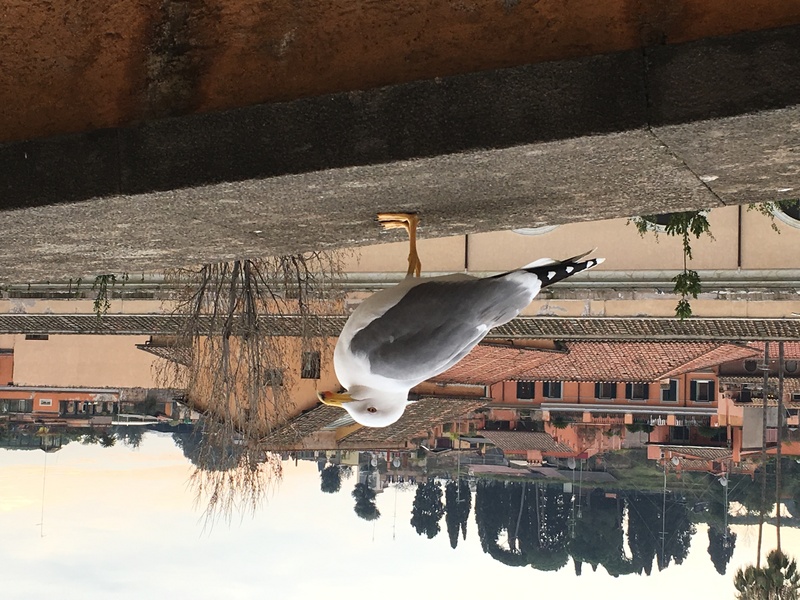 Back when I was traveling to Rome with my dad in January I took some notes and sent them as an informal German newsletter to a couple of friends and family. Since I thought there are quite some good moments in there, mixed with scenes that I’m sure will make you chuckle, I thought I’d polish this up a bit and finally publish the piece. Additionally, I added some context where appropriate and some more humor for flavor. From Roma. To Roma. In Roma. Doesn’t matter, really. We’re going there by airplane via Vienna. Immediately when dad picks me up in Graz with his car, I get both an e-mail as well as a text message that our flight will be delayed. As we arrive at the airport, so arrives notification #2 about a further delay. We sit down for breakfast and another delay arises. Two hours pass. Nothing special to report from the flight. Eurowings has you pay even for snacks, but I’m not that starved. And I can’t see myself wasting money on something so terrible anyway, considering an experience from a previous flight. After we arrive at Fuimicino, we wait for the bus - which is also delayed but that delay is not announced. Rather, we idle outside and I’m freezing and shivering. Not that it would surprise anyone, I’m cold all the time. Then the bus takes us to the central train station. Dad wants to take a cab from there to the hotel. The driver intends to bill us 25€ for one kilometer and refuses to write a receipt (I wonder why…), so dad and me walk to the hotel. 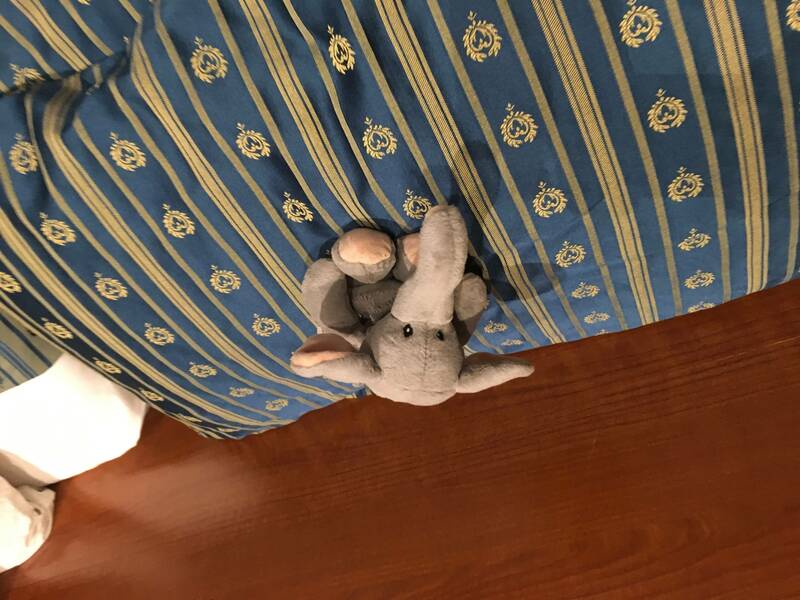 He’s a bit sick and has quite a heavy suitcase with him. I, uhm, well, I am reminded of walking with my (former) girlfriend, who also always seems slow to me. That is unexpected and I mention it to my dad. He replies: “well, I am getting old, you know”. I don’t reply since I’m not sure whether there’s a good answer to that. It is evening when we arrive at the hotel. The room is tiny. No, not what you’re thinking. It’s still tinier. The electronic safe has a malfunction. We point that out and are relocated to another room. That one is - at least in my opinion - even smaller but the safe works. But we manage to damage the light switch which gets stuck in the socket. Our patience for pointing out issues has run dry for one day and by the next day the problem has resolved itself. I assume the cleaning crew noticed and got it fixed. Dad wants to take a shower before bed. There’s no hot water - lukewarm is the best the shower gives you. Hot water is only available in the morning. This repeats on several evenings, leading me to suspect that the hotel is only heating the water in the night hours. We have dinner, with tiramisu. I like tiramisu a lot. On the way to bed I notice that Italy uses different power plugs than Austria and I get a really bad feeling since we’re planning to rely on Google Maps on my phone for navigating public transport thanks to @viticci‘s assurance that this works well for Rome. Later, I realize that I can use the plug of my iPhone but not the one of my iPad, which is bad because it dramatically reduces my potential maximum reading time. Read: I cannot charge and read at the same time. The next morning I wake up after little sleep and a lot of reading. No, I’m not looking for your sympathy, that’s okay. I’m not looking for your understanding either. Since we have some time left before our scheduled visit of the coliseum (pre-booked online to save queuing time) we get ourselves public transport tickets which are valid for a whole week. Well, after discussions with the clerks of various minor shops on where to get such a ticket. The answer is, unsurprisingly: the vending machine. (For context: That’s not how it works in my hometown where the vending machines provide only shorter durations) Then we go - heavily reliant on Google Maps and its awesome feature for navigating public transport - to Terme di Caracalla and enjoy the scenery. 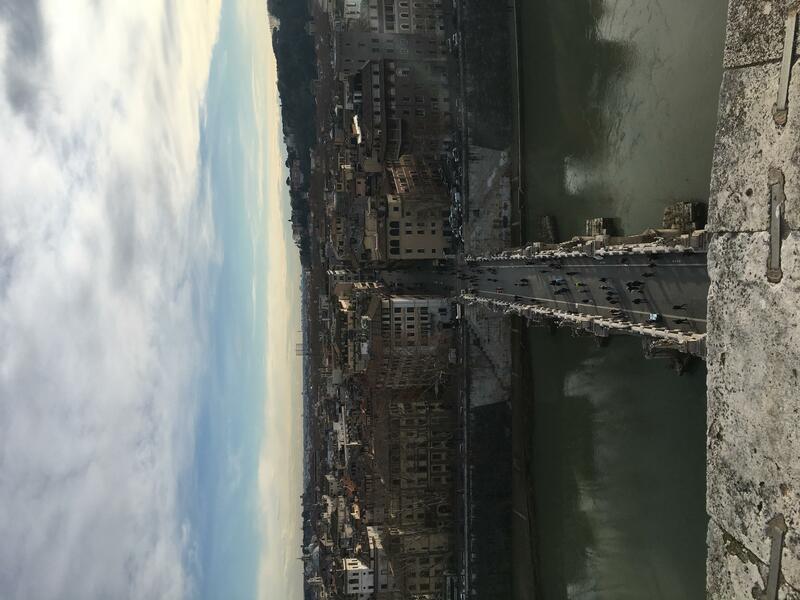 I am strongly reminded of Assassin’s Creed: Brotherhood which is good and a prime reason I wanted to go to Rome. It’s constantly raining, but only lightly. Next is the coliseum. We take the metro there but are wondering if our ticket is actually valid for the subway (at the point of taking the notes I didn’t know; at the point of typing this I still don’t know), but a friendly man waves us through after seeing our confusion. The moment we arrive the rainstorm CARROT warned me about started. 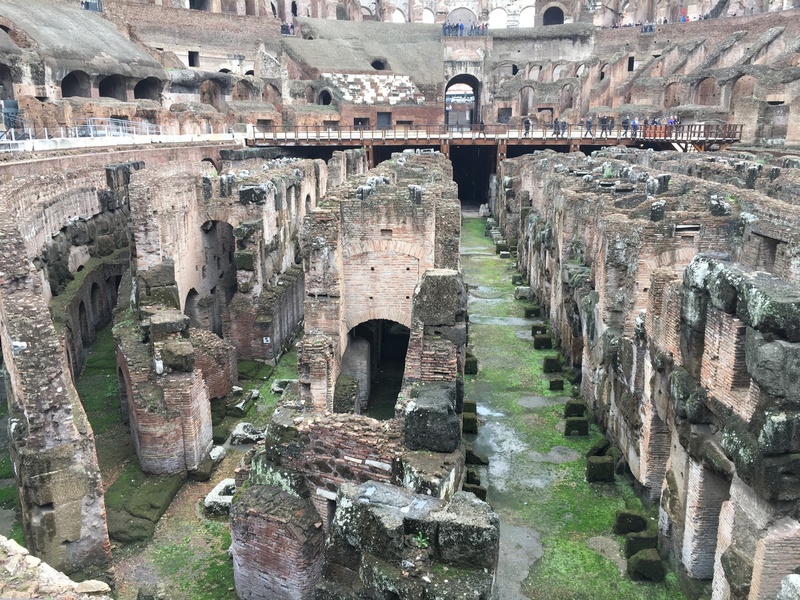 Some minutes later though, everything around the coliseum is empty and only a few tourists stream back in. We are checking it out using an audio guide. Yes, one audio guide. My hearing is good enough that I can listen to the one that my dad wears without stepping closer and I opt to just ignore the one I’m wearing. It’s a strange feeling listening to the German guide after opting for English in just about everything for years due to excessive Internet usage and being scarred by bad video game translations. The coliseum is indeed massive and extremely impressive. Due to the small amount of people who have not escaped the rain it’s possible to take lots of great pictures without being trampled or having to hurry. Where there is usually a waiting time of several hours, we manage to pass through in about ten minutes, for two queues. Afterwards we’re looking for nourishment. I suggest #1 from the Tripadvisor suggestions (or was it #7?). Dad wants to sit though and not eat street food. Given this sounds smart, I stop arguing. The alternative restaurant is… okay. The chocolate cake is extremely chocolatey. They serve neither fruit tea nor mint tea and I’m annoyed. Nevertheless we sit down again and have a second serving to escape the second rain this day. The rest of the evening consists of long conversations and reading time. In hindsight it’s likely I read until the iPad ran out of battery. I spare myself another disappointment and skip breakfast. Dad comments on how miraculous a skill it is to be able to burn coffee. We spend the morning visiting Forum Romanum which is again, very impressive with all the ruins and temple structures. It is amazing that they are so well preserved. We are taking many, many pictures. Dad is mostly taking video scenes of a few seconds each which he will compose into a longer movie at home. I’m the photo guy, capturing everything with my phone’s camera. I’m a little disappointed by the garden on top of the Palatin but that’s to be expected when visiting in January. It’s a pity, really. 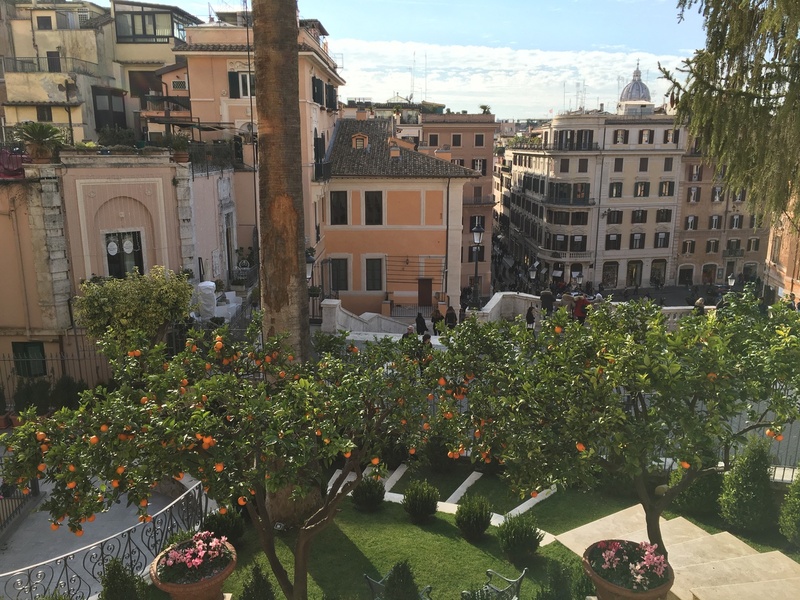 I have seen many trees in and around Rome that are already bearing oranges and lemons. There are also birds chirping, something that happens much later in Austria. We spend our lunchtime at the train station. It’s okay. There’s Fanta Lemon which is an exceedingly great find and suddenly my world is whole. Next we ~~hippity~~- hop over to the Hop On Hop Off bus, or at least we try. Despite my advanced mastery of Google Maps we’re not able to find the bus stop and go for the next one. (Since the Internet isn’t too great a medium for relaying tone: yes, that was indeed sarcasm.) We manage that and are taking the red line. We’re passing many sights, for example the Castel Sant’Angelo and I’m not sure which ones we want to visit next. The bus has an open roof with a panorama deck and - as expected - I am cold for 1.5 hours. I’d still recommend the tour with audio guide, though. Dad mentions how well we’re finding our way around with Google Maps. I respond that would also be possible in Austria if the companies behind our public transportation weren’t so hard-headed about opening their routes and schedules. The keyword here is open data. The following days were part 2 of the newsletter. 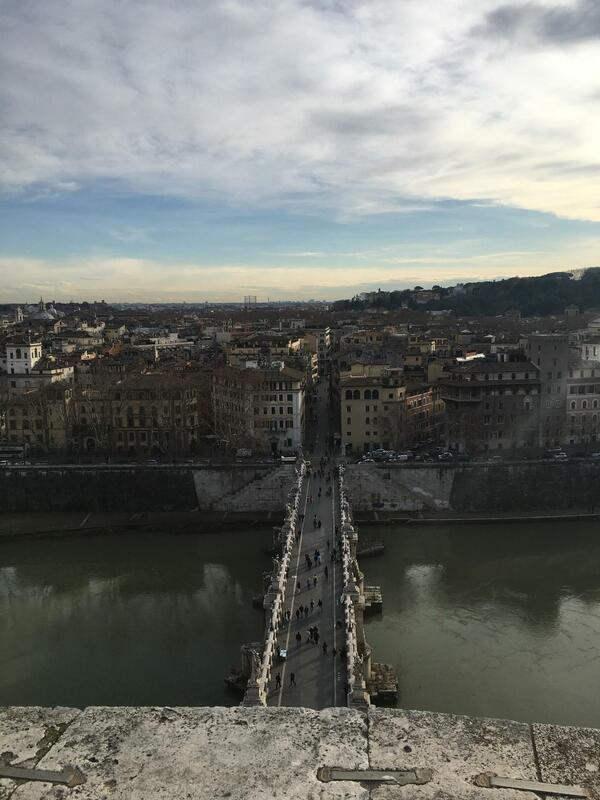 Tiber Island. It’s not as spectacular as expected. Might be because that’s where my video game used a lot of creative freedom to make it more interesting to the players. In the game, the headquarters of the assassins is located here. The island itself is smaller than I remembered from the game - there’s only place for some buildings that make up a hospital, one larger church and one or two trattorias. I make photos of the currently used bridges as well as the damaged ancient one. Pantheon. “That’s the big round thing with the hole”, I say. I explain the scene featuring the pantheon from the game where you’re climbing in through the hole in the roof. The conversion of the temple to a church is fascinating and the scale of the building is incredible. I am distracted and my thoughts revolve around tiramisu to come but I’m still taking a lot of pictures. Mr. 100 Tiramisu. After delicious lunch at a baguette store with fresh bread - that happens not be part of a franchise like Subway - we’re finally getting to the main part of this day. This shop has 100 different variations of tiramisu. The ingredients for the one I wanted are both no longer in stock (mint, strawberry). They have a tiramisu template and that one is garnished with fresh ingredients before your eyes. I order one with orange zest and dark chocolate… and another one with lemon zest, rosemary and honey. Both are excellent. Dad complains that his one was too sweet. I look at him, puzzled and try to imagine how anything can be too sweet. Despite my best attempts I fail to integrate this view into my world view and give up. I neglect to take pictures of dad’s tiramisu but since it has nuts, I can’t have been good anyway. 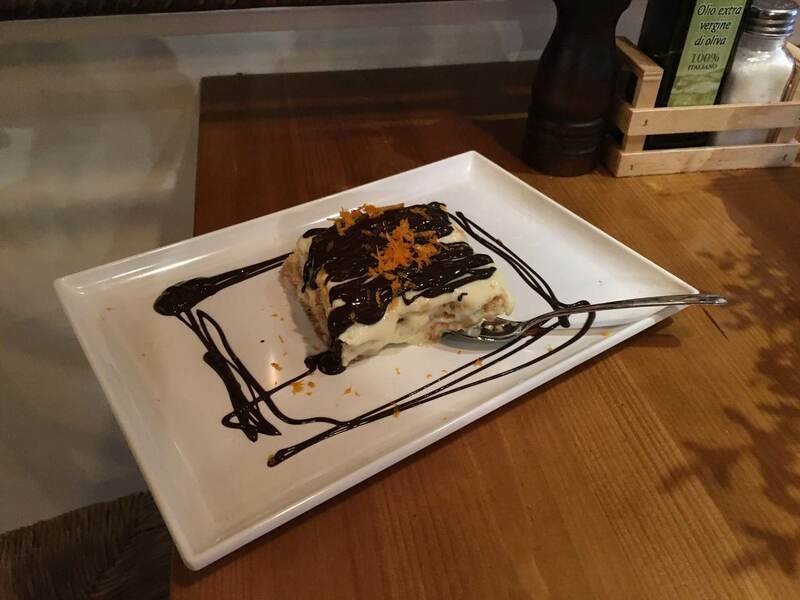 I praise the tiramisu and talk with Mr. Tiramisu about Tripadvisor (we’re sadly losing a joke due to the translation since “via Tripadavisor” and “about Tripadvisor” use the same words in German). 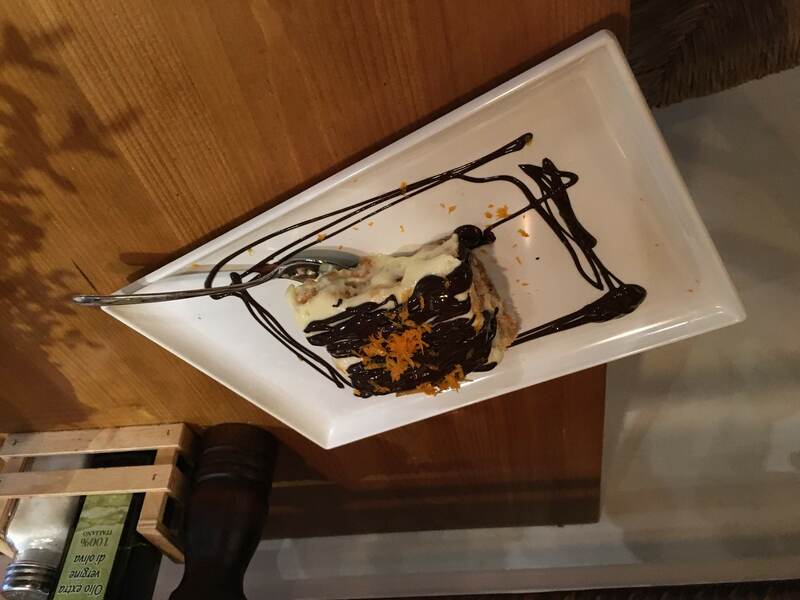 Have I mentioned that I like tiramisu? In the evening we’re eating at Tempio di Minerva again. I get a stew, dad goes for the delicious tomato soup I had the day before. That one was superb and most definitely one of the culinary highlights of this journey. The waitress smiles and laughs when I order a soup after the main course, stating “A nice dessert, yes”. Castel Sant’Angelo, outside. We spot a signpost detailing the changes made to the castel through the centuries. I am trying to figure out which of the pictures resembles the model I know from the game most. We’re moving on to St. Peter’s Square but due to lack of faith we’re neither entering the unending queues to visit the Vatican nor the Sixtine Chapel. Instead, we head for the museum about Leonardo da Vinci. In their exposition, there are pieces known from the game like the parachute, the tank, the machine gun as well as multiple flying machines. Near St. Peter’s Square, we are having coffee and Coca Cola where the 0.5 liter bottle goes for 8€. Yes, there was actually a reason behind this. I think. Memory is a funny thing. We walk into the Vatican’s area, though we are not strictly inside the walled off area. Technically we have a sandwich in the Vatican but it’s bland and I disagree with the decision of exchanging flavor for more sightseeing time. Castel Sant’Angelo, inside. The whole building and the surrounding walls are extremely impressive. I remember a lot of stories from the whole Assassin’s Creed series and tell them to dad, whether he wants to hear them or not. We’re at the terrace on the roof and I take some panorama pictures. The place is awe-inspiring but we’re not going for the audio guide this time around. We have bad luck on the way back from the castel. Really bad luck. Due to the strike the bus is very late and extremely packed. I’m talking so packed that I cannot stand straight in there and I can only manage to grab something not to fall over while bending in pain. I would’ve exited immediately, that’s something I have to admit. Dad wants to go by bus. I would’ve preferred an eternity of walking to sharing basically no space at all with strangers. Especially when you’re pressed to each other already. Dinner at an Indian restaurant (because that’s what you go to Italy for, right?). While the restaurant looks closed from the outside… it also looks kind of shady on the inside. It’s very dark, often black or purple with low ambient lighting. The food is awesome though. Ginger tea. Gumbo (also known as lady’s fingers). Despite my anger about the effects of the ATAC strike and going by bus I judge this a good day. It’s interesting how much effect the last impression of a day has on the overall impression of a day. 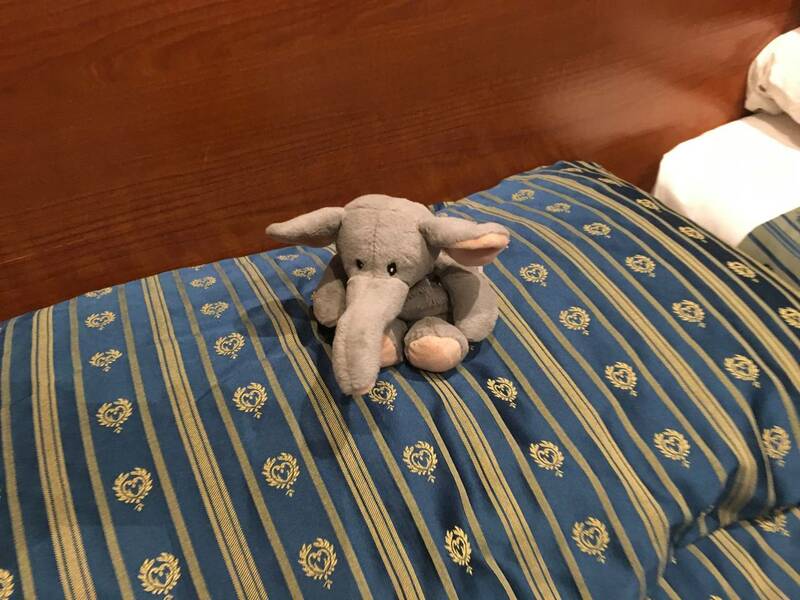 Upon returning to our hotel room I have to smile given that the cleaning crew has arranged my stuffed elephant I have with me on the pillow to look at everyone coming in through the door. I think that’s a cute gesture. The following sections are written for publication and not based on notes from the trip. I get up and use the mytaxi app to call a cab which works perfectly. I arrive quite a bit early and talk with some of the BSides Roma organizers. They are stumped that someone made the long trip from Austria as they expected mostly locals to show up. I ask which of their presentations will be held in English since I saw that one had an Italian title on the schedule. They aren’t entirely sure. They say they will talk to the speakers and let me know that the global BSides community told them not to expect too many internationals at the first event. So, of the 8 sessions, only 2 are held in English. If you’re about to ask me if I didn’t expect this: No, I didn’t. This was my 3rd or 4th BSides and the first one that had any non-English talks. Feel free to skip this part if you’re not here for the tech. I have a vague idea of what is in this talk. That is because while the talk is in Italian, all the slides are in English. I don’t understand why the talk isn’t in English if the slides are. The topic isn’t that interesting to me but it has some nice refreshers on concepts I have forgotten. The JS deobfuscation impresses me a lot, as I have never seen such a thing before. Entirely unreadable structure are translated into code that can be reverse engineered for analysis and threat detection. The presentation is in Italian but easily followed due to good slides and demonstrations. I spend the majority of this talk in a nearby café talking with, well, someone I cannot find anymore on Twitter. Or in another form. I was sure they had a blog too but I cannot find that either. This is the first talk held in English. The presenter only decided in the morning that he would hold the talk in EN. I really wish I had taken notes during this since the topic of routing protocols is fascinating and leads to some understanding of large scale attacks. I wish I took notes. According to my tweet this is the second talk held in English but I don’t remember it matching my interests too much. I leave because I don’t expect the following talks to be in English and it has been a long and exhausting day due to trying hard not to fall asleep when you can’t understand most of the content that’s being presented to you. I decide to walk to the hotel, taking a long detour and hoping my phone battery doesn’t die from all the tweeting at BSides since I need it to find back. I still take some pictures of the city walls in the gentle evening sun and pass by the Ministero Difesa Aeronautica. There’s a striking monument on top of the building shaped like a bird spreading its wings. Dad and I spend the evening with dinner, me with a lasagna and him with a risotto. I declare that I don’t have any inclination for long conversations on this evening, having had to listen to people talking all day. We visit the Pyramid of Cestius - another remarkable landmark that I remember from Assassin’s Creed. I am sad that we cannot get a tour. We meet people who are taking a tour despite arriving there on a day not listed for public tours. In a show of my brain not working, I don’t get the idea of asking to pay right there and then and joining. I really want to see the inside but that isn’t enough to try and be spontaneous. I take pictures, we talk a bit about the historical background of the pyramid and move on. The Capitoline Hill has a nice view and some spectacular buildings. 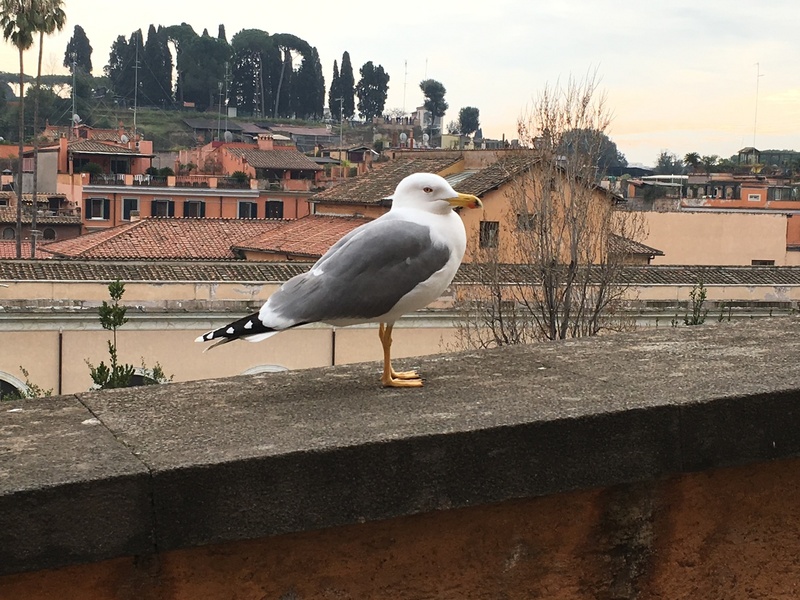 While the buildings are fine, I spend quite some time taking shots of seagulls who are okay with you walking as close as one meter, some even looking at the camera. I am half expecting one to ask me for food if I continue taking photos without asking for permission first. We have lunch in the vicinity and I eat the most disappointing lasagna I ever had, deep-frozen ones included. 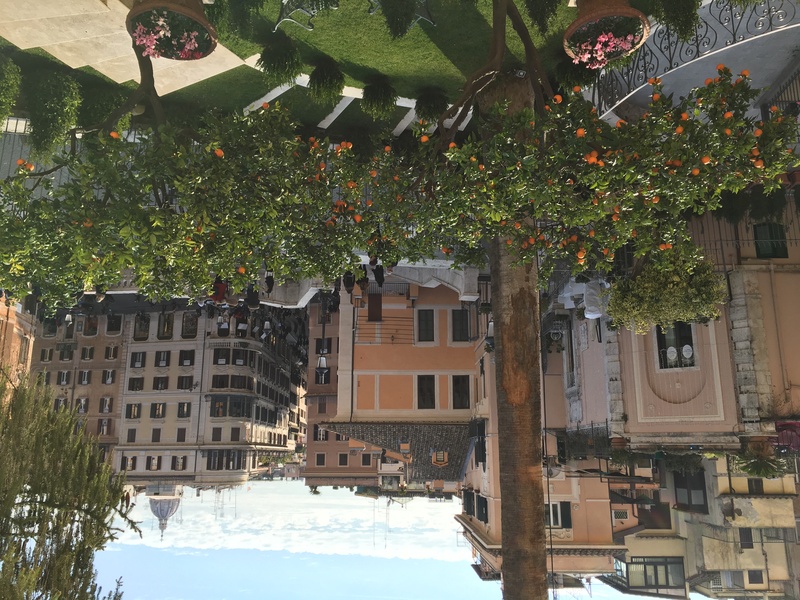 Towards the evening, we visit the Spanish Steps and walk down to the Piazza di Spagna which is incredibly crowded. If you were to try and take a shot of the fountain in its middle, you couldn’t see anything on the image due to the crowds. The view on the steps is very nice, with more orange trees already bearing fruit in a fenced off area on the steps. I suggest stopping at the Mausoleo di Augusto on the way back, but that one is undergoing renovation and not open for public. On the way back, I make the usual paranoid InfoSec jokes about public phone charging stations and their security implications. Dad looks at me confused and I go back to reading my next novel. I am very pleased with the diverse food offers at Fuimicino airport and the journey back to Graz is without any disturbances.